Milton in the afternoon when the temperature is high and no wind blowing. 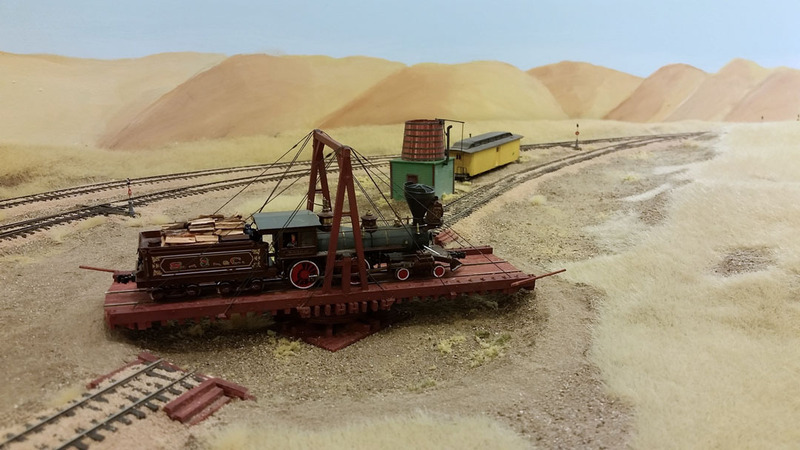 The Walthers corral is in the foreground while the Revell handcar/section house is beyond. After much effort and time, I think that Milton can be considered complete, at least until I decide to add something else). 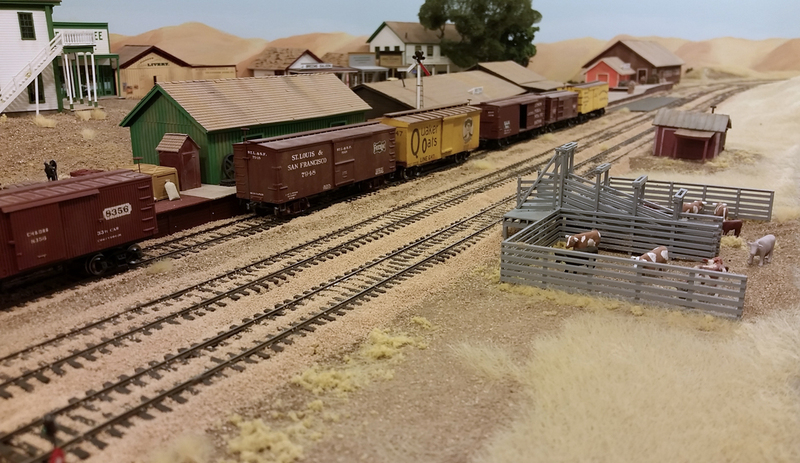 The last things to be done was to build the turntable and add the corral and tool house. Engine 8 is being turned on the turntable.Behind it is a small scratchbuilt water tank and an older baggage car which has been de-trucked and is now used for miscellaneous storage and, occasionally, sleeping quarters. The turntable was built from plans for a standard Southern Pacific turntable of the period. Wood was used for the construction and the table is moved manually through a worm and worm gear arrangement. It's a little different than that seen on most models but it is very prototypical. This type of table is called an A-frame turntable, not to be confused with a gallows type turntable which has a square timbered structure in the center rather than the type which give this table its name. Both types can also be called Prairie Turntables which were designed to be set up on the ground without benefit of a pit. They were used when the turntable was planned to be temporary or when the tracks coming off the table were minimal. There are no pit rails installed but just some wood buffer blocks which ensure that the rails are of the right height at each end. A thin strip was styrene was glued over the blocks to make the table slide easier. A special excursion train departs Milton. 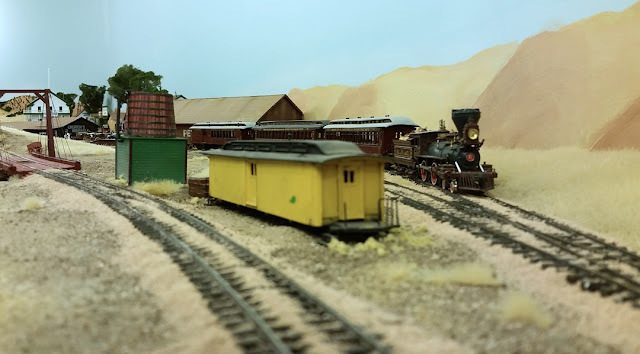 In the foreground is the old baggage car now used for storage and, behind it, the water tank. The original set-up at Milton did not have water facilities but Peters, which did have a tank, was not too far away and one was not need. 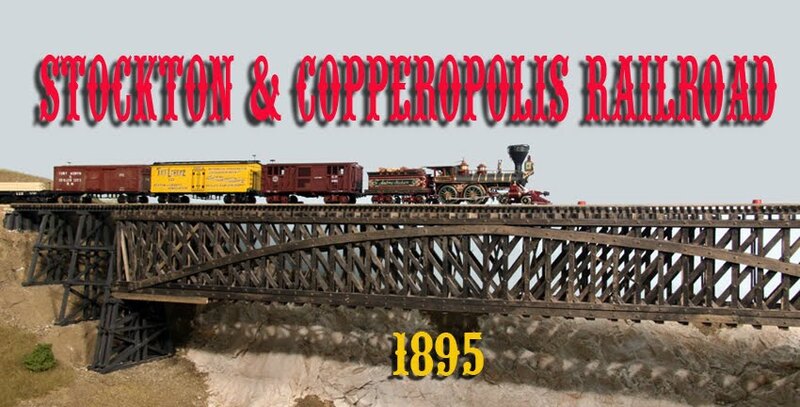 On my version of the S&C, I extended the tracks to Copperopolis and, since Milton is at the base of a hill, I might use helper service some day and wanted to provide water for the engine that would be stationed here. The corral was built from parts of a Walthers corral kit and the little section/handcar house was an old Revell model I assembled many years ago and which was on my layout in California. Copious amounts of static grass and California dirt completed the scene.